So far this year we have had a look at a couple of dressy worldtimer watches such as the Jaeger-LeCoultre Geophysic UT and one from Frederique Constant so we thought we’d add another one into the mix for your consideration at this time when many of you will be travelling for the holiday period. 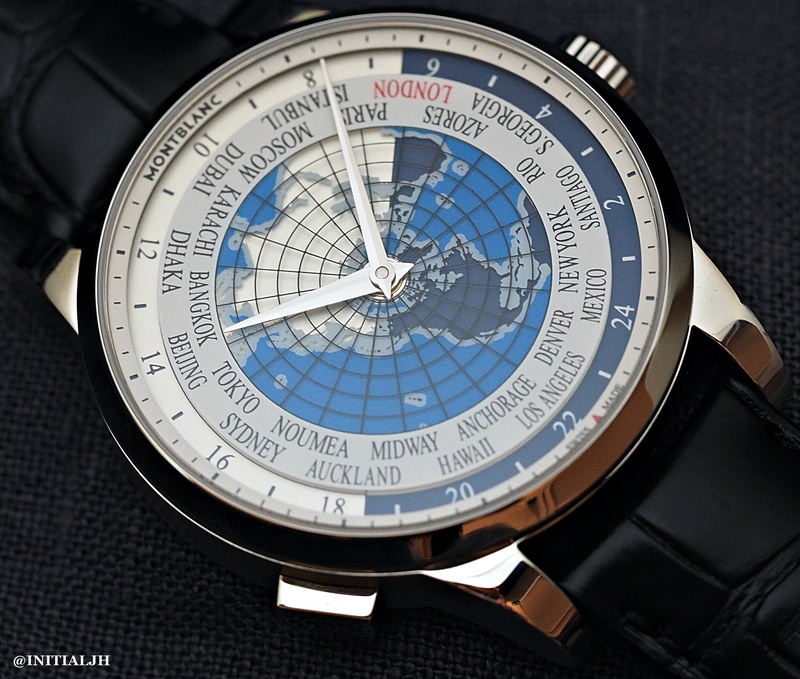 From Montblanc comes the Orbis Terrarum, launched earlier this year as one of a variety of travel-themed (whether in terms of your travel or those of Vasco Da Gama) pieces that have been released this year. Part of the Meisterstück Heritage Collection (yes as in Meisterstück pens), this world-timer follows some popular design cues on the dial which will make it familiar to many, especially those familiar with Vacheron Constantin to cite one example. 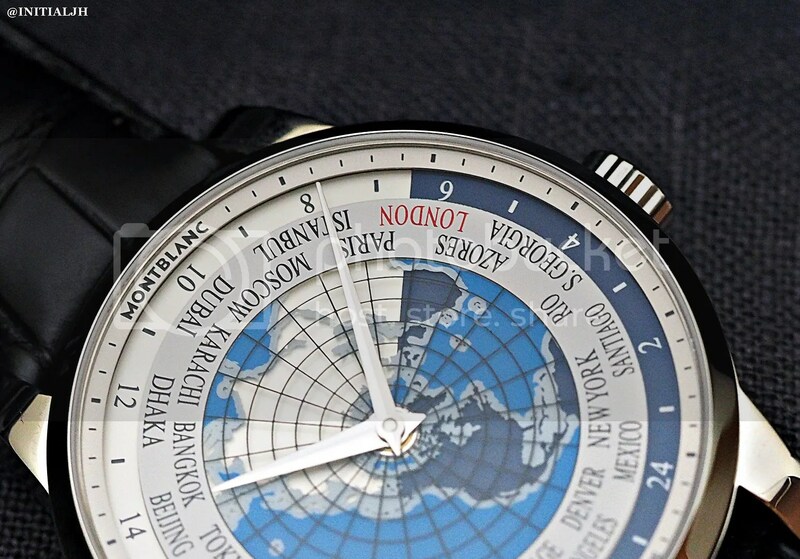 The dial is a planisphere of Earth as viewed from the North Pole. Twenty-four cities are listed on a disc indicating both twenty-four time zones and day/ night (white/ black). For those unfamiliar with world-timers the hour and minute hands are for your local time. When you travel, just adjust the centre hour and minute hands to your new ‘local time’. Your home time remains at 6 o’clock on the twenty-four city disc (the small red arrow). The disc with the twenty-four cities can be rotated independently via the pusher at 8 o’clock in one-hour increments. The case is 41mm in diametre, 12mm thick, and comes in either 18k red gold or stainless steel. 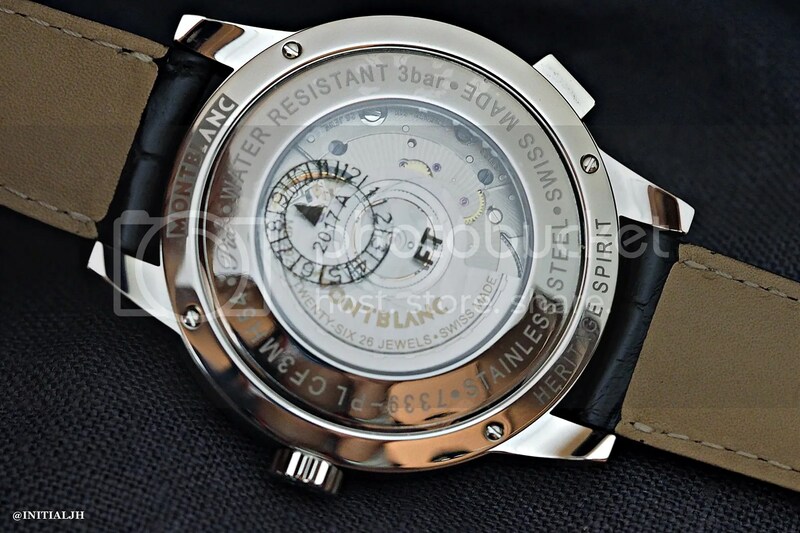 Inside is the Sellita-based Calibre MB29.20 with a forty-two hour power reserve. With Montblanc going through a renaissance under the stewardship of Jérôme Lambert, the new Orbis Terrarum has been another bold move into positioning Montblanc at very attractive price points across a range of men’s and women’s watches, particularly when it comes to complications. The RRP for the Orbis Terrarum is 4,990 EUR for the stainless steel model on a leather strap, 5,260 EUR for the same on a bracelet, and 13,900 EUR for the red gold model on a leather strap. For some other worldtimers we’ve looked at this year, click on this link.